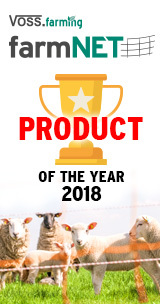 Sheep netting, poultry netting, electrifiable pet netting - "Made in Germany"
wolf netting with extra clamps for safeguarding against wolves! 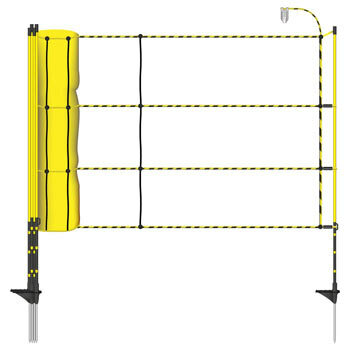 Is an electric fence always the best choice? No, in some situations it is better or simply easier to use electrified netting instead. 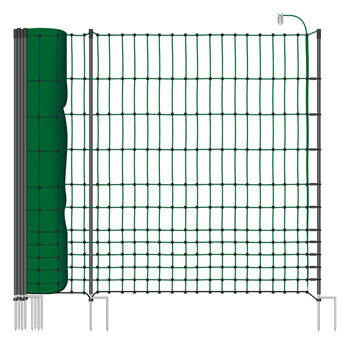 Especially when it comes to wildlife fences, it is a good idea to have a look at our specialized nets on offer. 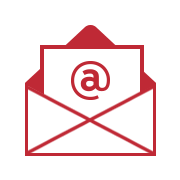 Which animals can be kept in or out with electrifiable netting? In some cases the use of a mobile net or electric netting instead of a traditional fence is beneficial. 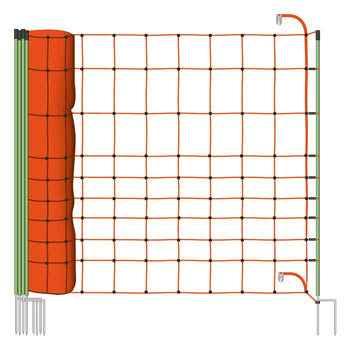 It is also possibility to additionally equip a conventional electric fence with electric animal netting to increase the security. 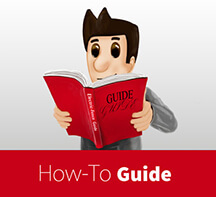 Depending on what the net is meant for you can choose from various models. 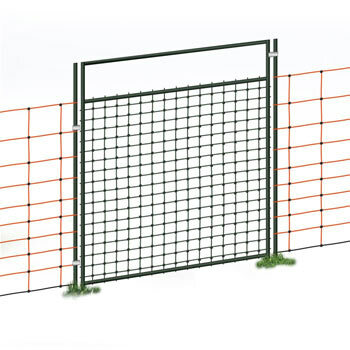 Because they are available in different, colours, lengths and heights, nets can be used for a wide variety of animal species and fencing situations. 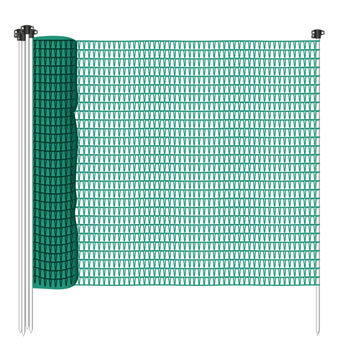 Our range of animal netting starts with lower models that are often used for sheep or small animals such as pets at home. 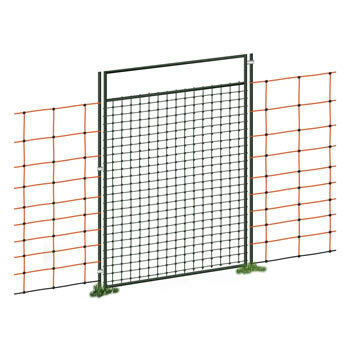 But we also offer very high or special fence nets that can even be used to keep out deer and other wild animals like the wolf. 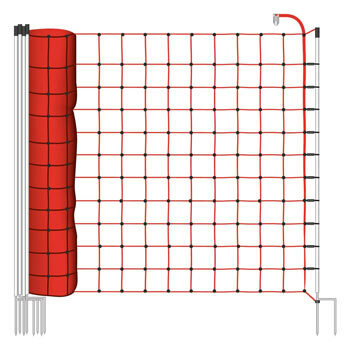 Electric fence netting is very quick and easy to set up and provides great security, thanks to small mesh sizes (depending on the model). Our electric nets are made of highly durable, hardwearing material. 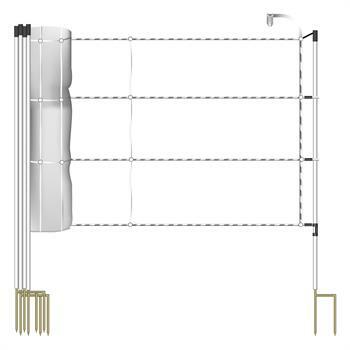 This ensures that curious animals inside or outside are unable to destroy the net meshes by biting the material. Maximum security is provided in various ways: The conductive wire is woven into the net meshes. The energizer supplies the strands with electricity. As soon as an animal touches the net, it closes the electrical circuit and receives a brief but unpleasant shock as the electricity flows back into the energiser via the ground. High quality netting has welded/sealed mesh intersections and is UV resistant. Plus, the insulators of our electric netting are attached in strategic places. 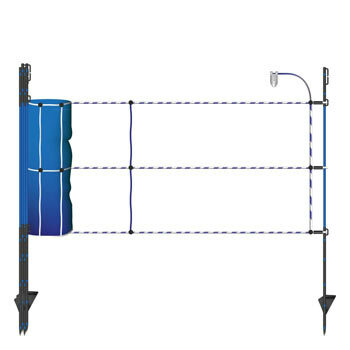 Stable insulating poly posts and the necessary connection accessories are provided with the sheep nets. Several horizontal plastic strands with integrated current-carrying nickel-chromium wire are the heart of the livestock nets. 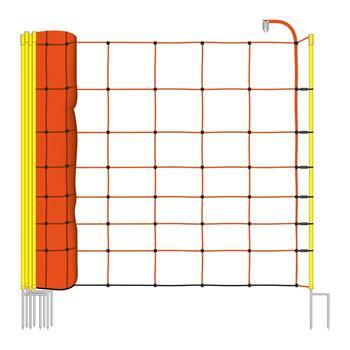 Poultry netting is generally constructed in the same way. 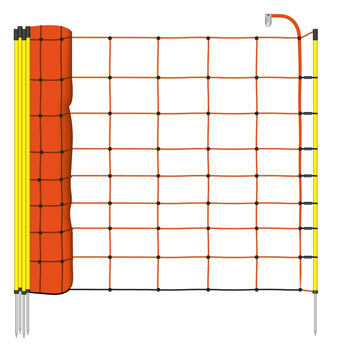 With the difference that poultry nets are higher and have smaller mesh sizes. This makes them great for other animals, too, such as dogs, cats, rodents, goats or lambs. If you are sure that you won't require electricity, a non-electrifiable net might be an option for you. These nets can proof sufficient for chickens, geese and other smaller animals. We also supply specialty nets for small animals like rabbits or puppies. 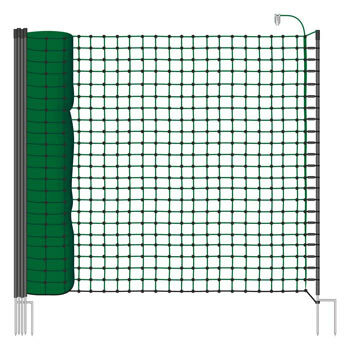 The pet nets are lower in height but they have especially small mesh sizes. 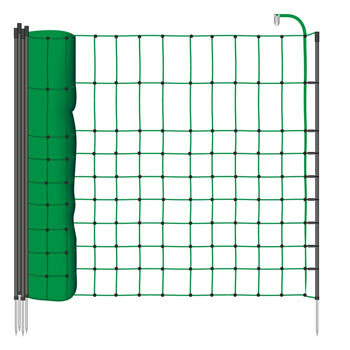 We offer them in the colour green which make them a popular choice for electric fences in the garden. And even wildlife can be kept out with netting. 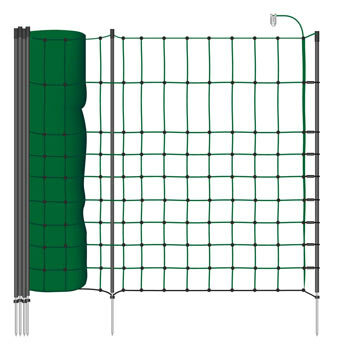 Our wild animal nets are a quickly installed and movable solution if you compare them to standard electric fences. Electric netting is suitable to keep a wide variety of animals safe and sound inside a field or your garden. Animal nets are quickly installed and you can move them if necessary. There are many different sizes and specifications available to suit the specific requirements of different animal groups. Green electric netting is often the preferred choice for gardens. They are inconspicuous and blend well into the surroundings. Brighter electric nets, on the other hand, act as a visual barrier, too, and may sometimes be the better solution. If you are in doubt which kind of electrifiable netting is right for you, then simply pick up the phone. We are happy to help.